The 3rd International OTEC Symposium 2015 was held from September 1 to September 2, 2015 in Kuala Lumpur, Malaysia (IOSKL 2015). Universiti Teknologi Malaysia (UTM) hosted the symposium to share valuable information on OTEC from academic and industrial sectors. About 200 OTEC experts and participants from all over the world including France, Indonesia, Japan, Korea, Malaysia, Netherlands, Philippines, Singapore, Sudan, Sweden , and USA have participated in the symposium giving brilliant thoughts to the OTEC community for the future of OTEC research and its commercialization. Presentations given at the symposium are available for download. The symposium was followed by a courtesy dinner for all participants, where the launching of the UTM Ocean Thermal Centre (UTM OTEC) was officiated by Prof. Tan Sri Zakri Abdul Hamid, The Science Adviser to the Prime Minister of Malaysia, “by means of a traditional gong ceremony,” said by Dato’ Ir Dr A. Bakar Jaafar, the Co-Convener of the 3rd IOSKL 2015. 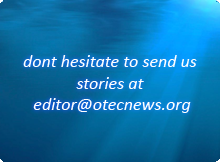 The 3rd International OTEC Symposium 2015 was a follow-up of the first two: the 1st International OTEC Symposium held in Honolulu, Hawaii, 9-11 September, 2013 and the 2nd International OTEC Symposium held in Goseong, Korea 20-21 June, 2014.